Find more Fix-It Clinic information online. Fridays: 10 a.m. – 6 p.m. Need a recycling container in a park or public building? Our Be Active! Be Green! grant program is available for public entities to purchase recycling containers. Help make recycling easier when on-the-go. Call 651-266-1179. Do you have an innovative idea to increase recycling through your city, school, park board, library or watershed district? Grants are available to help kick-start your idea! Call 651-266-1199 or email AskEH@co.ramsey.mn.us . Waste collected in Ramsey and Washington Counties and beyond is hauled to the Recycling & Energy (R&E) Center to be turned into fuel for energy. The R&E Center is owned by the Ramsey/Washington Recycling & Energy Board. 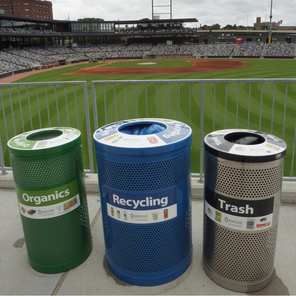 When the St. Paul Saints started planning their new ballpark, CHS Field, in 2014, they decided that it was going to be the “greenest ballpark in America,” with a major focus on recycling and organics recycling. How are they achieving their goal? By using BizRecycling grants, the Saints have created a robust recycling and organics diversion program. BizRecycling works with interested businesses of all sizes, in Ramsey and Washington counties, to start or improve their recycling or organics programs. Recently, the Saints welcomed BizRecycling to do a comprehensive audit of the recycling, organics and trash collected during a typical game day. This “waste sort” allows them to see how the recycling and organics diversion program is working, and find areas for improvement. By simplifying their waste into three streams (organics, recycling, trash) CHS Field is already recycling 64% of their waste. BizRecycling found ways to improve those numbers, including more staff training and increased use of compostable service ware. The Saints’ dedication to reaching their goal of a 90% recycling rate at CHS Field is inspiring! 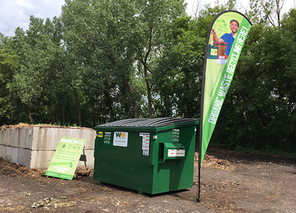 Ramsey County residents can now recycle organic waste at the Arden Hills yard waste collection site! Examples of organic waste include food scraps and non-recyclable paper like paper towels and napkins. Pick up a free organics starter kit and compostable bags at any of our yard waste sites and get started today. For hours and accepted materials, visit RamseyRecycles.com/organicwaste or call 651-633-EASY (3279), which is answered 24/7. Recycling and properly managing construction and demolition waste. The county is also investigating emerging technologies that will increase recycling and produce biofuels. In early August, you can find a draft copy of the Master Plan online and get a print copy at a Ramsey County library. Did you know you can recycle aerosol cans? It’s true! Empty aerosol cans that once contained non-hazardous product like whipping cream, shaving cream and sunscreen, can go in your recycling cart. To find out what other items are recyclable at home, contact your recycling service provider, your city or visit RamseyRecycles.com/generalrecycling. You can also call 651-633-EASY (3279), which is answered 24/7. What is a Ramsey County yard waste site and how do I use it? As you enter the site show the attendant your photo ID, this is required since yard waste collection sites are only open to Ramsey County residents. 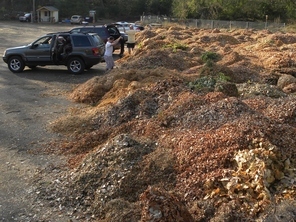 Dump your yard waste into the appropriate piles and take your empty bags with you. Even biodegradable bags should be taken with you. Exit the site and return the next time you have yard waste to dispose of! Remember, you can always ask a site attendant for help. For hours, locations and a list of accepted materials, visit RamseyRecycles.com/yardwaste or call 651-633-EASY (3279), which is answered 24/7. Ramsey County continues to make progress on reducing energy use as part of its daily operations of both buildings and fleet. Recently, the Fleet division of Public Works ordered two all-electric vehicles (EVs), bringing the county’s total number of EVs to three. 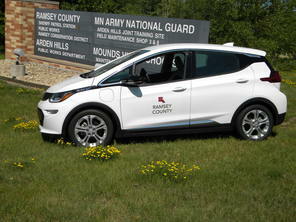 “We are learning about electric vehicles and exposing both drivers and mechanics to this new energy efficient technology,” said Pat McCoy, Fleet Manager for Ramsey County. During the past five years the fleet team has eliminated a number of older, inefficient vehicles and pieces of equipment and right-sized 50 vehicles to better match the work being performed by those vehicles. “The hybrids, EVs and vehicle right-sizing program are helping the county reduce its carbon emissions and save money,” McCoy continued.